First, I wanted to say that since everyone will have a holiday hangover, I’m going to postpone the 26th Virtual Poetry Circle until the new year! I wanted to share with everyone the great Secret Santa gifties I received from my LibraryThing SantaThing and my Book Blogger Holiday Swap partner! Left to right (sort of): Melissa Dela Cruz’s The Van Alen Legacy, Book 1 of Vampire Academy, Book 1 of The Vampire Diaries by L.J. Smith, all of which I received from my SantaThing partner. Thank you, sjmccreary! My Book Blogger Swap partner was Staci of Life in the Thumb! I just love her blog and who could have asked for a better partner! She sent me Book 5 of the Morganville vampires, Lord of Misrule. I don’t have any in this series, but the best thing is she sent a Gift card to Barnes & Noble, so I can get the other 4 books in the series! She also sent some great Ghirardelli Dark Chocolate (she must be reading my blog because dark chocolate is my favorite!). Some great paper and a pen and a great bookmark as well! Fantastic gift! Thanks Staci! My husband got me a gift I’ve been dying for: Inglourious Basterds, which came with a CD soundtrack! and Wii Resort! In the background, there are a couple of graphic novels I got for my hubby: The Last Temptation and The Zombie Survival Guide: Recorded Attacks. I also got him some chocolate covered pretzels, which he loves, and Blindness, Punisher, and Haunting in Connecticut. Oh, and we have this great video of my husband opening his big surprise before he had to leave for work on the morning of Christmas. Sorry, he looks really tired. 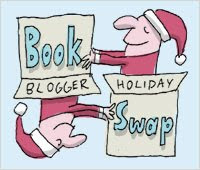 I hope everyone had a great holiday and received some great bookish goodies; I know I did. 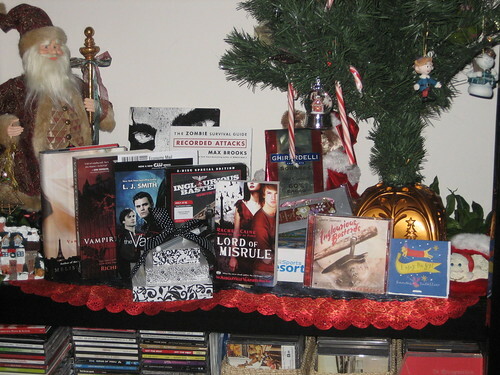 It was a very Vampire Christmas! Happy Holidays everyone! FTC disclosure: Clicking on links to book and movie titles will bring you to my Amazon Affiliate page; No purchase necessary. 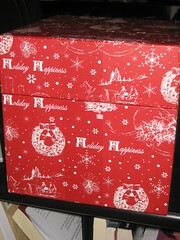 I signed up again this year for the Holiday Blogger Swap and my gift arrived today! No, I haven’t opened it yet, but I did take some photos of it when it arrived and when I took the paper off the outside to reveal a neat holiday box. 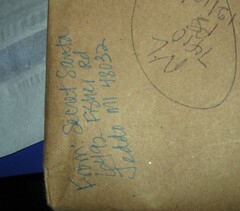 So what do you think is inside?